God is faithful to you,are you faithful to Him? 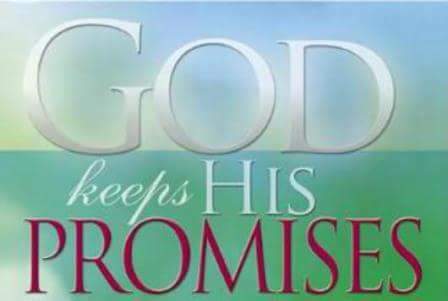 HE IS A PROMISE KEEPER. “Therefore know that the Lord your God, He is God, the faithful God who keeps covenant and mercy for a thousand generations with those who love Him and keep His commandments;(Deuteronomy 7:9 NKJV). “Let us hold fast the confession of our hope without wavering, for He who promised is faithful”. (Hebrews 10:23 NKJV). “Grace to you and peace from God our Father and the Lord Jesus Christ. I thank my God always concerning you for the grace of God which was given to you by Christ Jesus, that you were enriched in everything by Him in all utterance and all knowledge, even as the testimony of Christ was confirmed in you, so that you come short in no gift, eagerly waiting for the revelation of our Lord Jesus Christ, who will also confirm you to the end, that you may be blameless in the day of our Lord Jesus Christ. God is faithful, by whom you were called into the fellowship of His Son, Jesus Christ our Lord”. (I Corinthians 1:3‭-‬9 NKJV). “Now may the God of peace Himself sanctify you completely; and may your whole spirit, soul, and body be preserved blameless at the coming of our Lord Jesus Christ. He who calls you is faithful, who also will do it”. (1 Thessalonians 5:23‭-‬24 NKJV). “By faith Sarah herself also received strength to conceive seed, and she bore a child when she was past the age, because she judged Him faithful who had promised”. (Hebrews 11:11 NKJV). …My WORD goes forth out of My mouth: it shall not return to Me void (without producing any effect or change) but it shall accomplish that which I please and purpose, and it shall prosper in the thing for which I sent it. +God’s Word will do what He said it will do. Man shall not live by bread alone, but by every Word that proceeds out of the mouth of God. +God wants us to experience His Word everyday of our lives. +We must give the Word of God the Highest Regard and Reverence. God and His Word are ONE. +Disregard, Irreverence and lack of faith in God’s Word are the reasons why many do not experience the fulfillment of God’s Word in our lives. +Going forward let us give the highest Regard, Reverence, and Honor to God’s Word. AMEN!! !